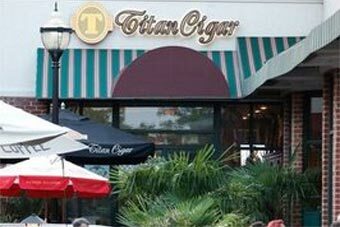 Titan Cigar is located off Route 3 in Gambrills, Maryland, in Anne Arundel County. If you live or work in the county, or near Bowie or even Washington, D.C., Baltimore, or Annapolis, you just might find yourself on a nearby road during your next commute. Stop in to Titan Cigar, have a good cigar and something to drink, enjoy some good conversation, and recharge after a long day. Or join us any day of the week for many relaxing and enjoyable hours. From Baltimore / Annapolis / Interstate 97: Take Interstate 97 and exit onto Route 3 (Crain Highway). Travel south on Route 3. Turn right on Waugh Chapel Road. Turn left on New Market Lane. Turn right on Echo Bay Court. Turn left on Chapel Lake Drive. You have arrived at Titan Cigar. From Bowie / Washington, D.C. / Route 3: Travel north on Route 3 / (Crain Highway). Turn left on Main Chapel Way. Turn right on Chapel Lake Drive. You have arrived at Titan Cigar.